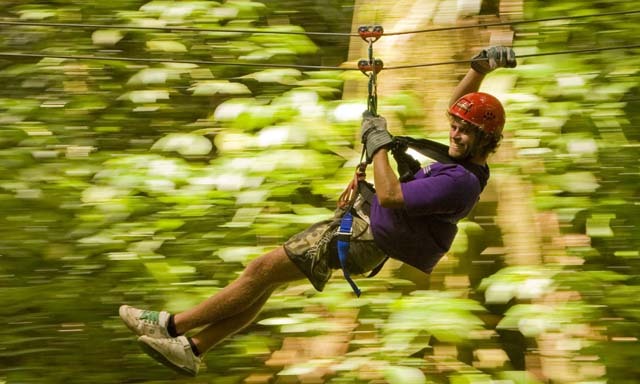 Overview: Embark on an exciting journey across zip lines and more through Antigua’s lush rainforest. Safe, fun thrills are the operator’s top priority, whose trained rangers guide and assist you throughout this treetop tour. Fly like a bird on aerial zips that run from 52 to 328 feet and challenge yourself on a vertical descent and walking across two suspension bridges. Toast your adventure over a drink on the veranda with beautiful views of the gorge. Highlights: Rainforest Tour: Enjoy thrills and views on 13 zip lines, a vertical descent, 2 suspension bridges and tree house. Recognition: Receive a Certificate of Bravery and complimentary drink as you relax on the veranda with gorge views. Scenic Transfer: See verdant countryside, pretty villages and typical West Indian architecture on a commentated 40-minute drive via air-conditioned coach. 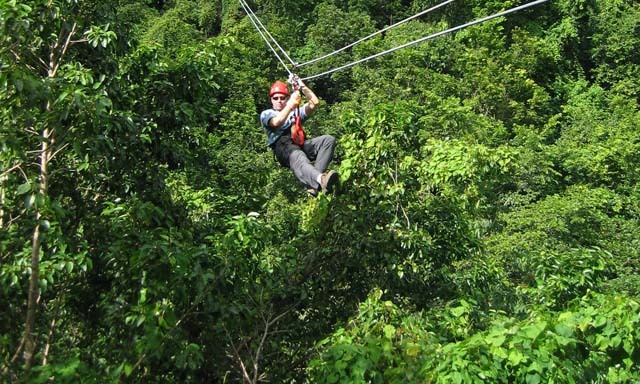 Overview: Take your Antiguan rainforest adventure to the next level with a thrilling zip-line journey followed by a challenge course that will have your heart racing and adrenaline pumping. Fly like a bird over and through the trees on 13 zip lines, 2 suspension bridges, 3 aerial walkways and 1 tree house before tackling a 9-part series of rope and cable bridges. Toast your hard-won Certificate of Bravery on the veranda overlooking the scenic gorge. Highlights: Rainforest Tour: Enjoy thrills and views on 13 zip lines, a vertical descent, 2 suspension bridges and tree house. Challenge Course: Unleash the athlete within on a 9-part series of rope and cable bridges. Scenic Transfer: See verdant countryside, pretty villages and typical West Indian architecture on a commentated 40-minute drive via air-conditioned coach. 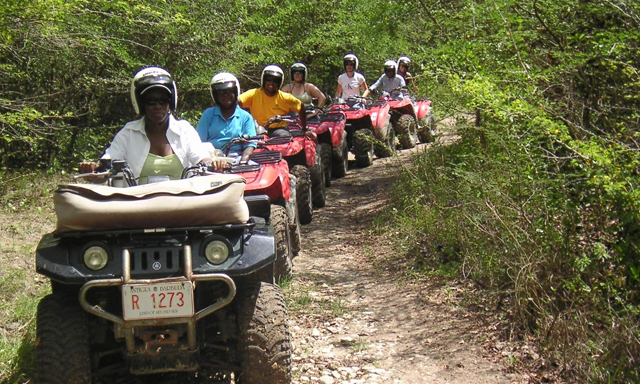 Overview: Take in Antigua’s raw, unspoiled beauty on this guided, All Terrain Vehicle tour of the island’s remote dirt tracks. Travel down cane roads past old estates on your way to Potworks Dam in the island’s center. Create your own off-road adventure as you enjoy two hours of free-wheeling fun, riding past verdant greens, rural farmlands and lush tropical scenery. Riders must be at least 18 years old and have a valid driver’s license to participate. Highlights: Off-Road tour: Enjoy raw island beauty as you barrel over remote dirt tracks on this free-wheeling, guided 2-hour ATV tour. Potworks Dam: Marvel at the beauty of this historic dam which serves as a key island water source. 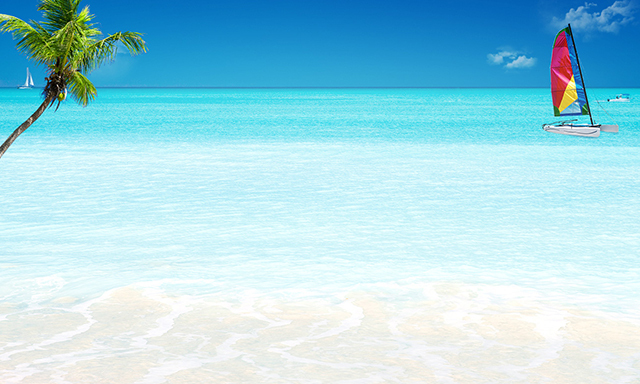 Antigua Scenery: Pass by sprawling estates, cane roads and rural farmlands as you travel to the island’s center. Overview: Escape to a tiny private islet for swimming, snorkeling and relaxing in an idyllic setting. Just a half mile from Antigua’s north coast, discover peace, natural beauty and a warm, friendly welcome at family-owned Prickly Pear Island. Explore the colorful reef on a guided snorkeling tour led by the knowledgeable crew, swim in the crystal-clear waters, or just lounge on your beach chair. An open bar and abundant buffet lunch complete this mini-getaway. Highlights: Prickly Pear Island: Swim, sun and relax on this private, family-owned islet off Antigua’s north coast. Guided Snorkel: Explore the colorful world of the reef with crew who know the area intimately. Open Bar and Lunch: Beer, rum punches, and soft drinks served all day. Buffet features seafood and Caribbean specialties. Overview: See the destructive power of nature on a pilot-narrated flight over Montserrat, the island devastated by its volcano in 1997. 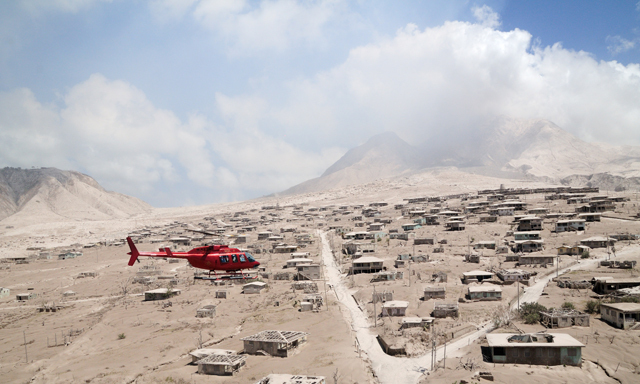 Only via helicopter can you get close to the still-active Soufriere Hills Volcano. Marvel at the gorge and delta that were forged by the violent eruption – and survey the abandoned capital, parts of which are buried in 40 feet of ash. The 50-minute flight culminates with bird’s eye views of Antigua and your ship. Highlights: Soufriere Hills Volcano: Get up close to the 3,000-foot-high powerful volcano that frequently emits smoke, ash and steam. Montserrat’s Exclusion Zone: See the devastated areas that have been evacuated, permanently closed off and only accessible via aerial tour. Antigua Views: Enjoy bird’s eye views of the island and your cruise ship in port on the return. Overview: Discover the pristine beauty of Antigua’s hotels, reefs and beaches on a breathtaking, narrated helicopter tour that includes more than 100 miles of shoreline. Strap into your helicopter and ascend into the sky for a dazzling view of the Caribbean Sea’s turquoise waters. Take pictures as your pilot flies past historic Shirley Heights and the super-yachts anchored at Falmouth Harbor. Head towards Sherkley Mountains, then return for a bird’s eye view of your cruise ship. Highlights: Bird’s Eye View: See the entire circumference of Antigua from the seat of a helicopter on this half-hour narrated tour. Historic Landmarks: Fly over English Harbor and Shirley Heights Lookout before heading to Sherkley Mountains. Antigua Sights: Photograph breathtaking sky views of Antigua’s rugged beauty as your helicopter flies over beaches, hotels and historic landmarks. I’d love a full island tour of Antigua. How about you? You will enjoy an historical tour of Antigua with a knowledgeable and professionalDriver/Guide in an air-condioned limousine and enjoy narrated commentary and anecdotes. Visit 2 of Antigua’s best known interesting locations whilst travelling through the heart of Antigua’s countryside and local villages. You will visit historic Nelson’s Dockyard, the only working georgian Dockyard in the Eastern Caribbean and Shirley Heights Lookout, which offers expansive views and photograph opportunities over English Harbour.